Beck hates his life. He hates his violent mother. He hates his home. Most of all, he hates the piano that his mother forces him to plat hour after hour, day after day. Beck is a talented classical pianist and his entire life is filled with practice and competitions and piano music. The other thing that Beck's life is filled with is pain. Pain inflicted by his mother, who beats him when he doesn't play, and beats him even worse when he makes a mistake while playing. Beck's life revolves around the piano and he hates it. He hates the practice and the competitions and his mother's bitter anger, the way that she forces him to be the great pianist she once was. The only time Beck doesn't hate the piano is when he is composing his own music, something his mother won't allow. The only thing about his life that Beck doesn't hate is his little sister, Joey, a ball of light, snark, and glittery rain boots, who above all else he has to protect from the piano. Then he meets August. August is full of life and energy and, unlike Beck, she doesn't seem to hate anything. Strangest of all she wants to be Beck's friend. Beck tries his hardest to persuade August that they can't be friends but she won't give up, and, despite Beck's best efforts, she starts to persuade him not to give up either. That makes one more person Beck doesn't hate. The root of the story lies in the conflicts of Beck's life. Beck hates playing the piano but at times, especially when he is composing his own music, that hatred blurs into passion. Beck knows that to stand up to his mother will only result in stricter punishment, but he wants to be able to stand up to her anyway. Beck doesn't want August to know the truth about his home life but, against his better judgement, he does want to be her friend. In the end Beck has many decisions to make, and none of them are easy. Despite his dark humour and stubborn will to push August away, Beck is an easy character to warm to, and that just makes his story all the more heartbreaking to read. 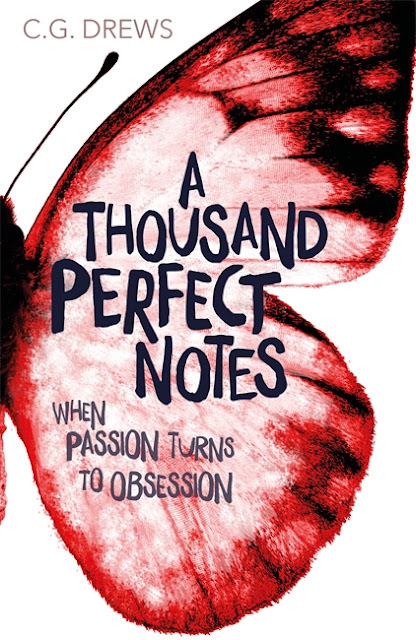 A Thousand Perfect Notes is a story of love, pain, and perseverance, about a boy trapped in a horrible situation, who doesn't want to be saved. Beck's story is painful and hard but, thanks to Joey and August, it also has laughter and hope. Using her own unique voice, C.G. Drews fills these characters with humour and light, a necessary balance from the darker subject matter. The passages describing the frantic fury of Beck's piano playing are particularly absorbing and viscerally emotive and the descriptions of Beck's Australian home give the book a grounding sense of place. This story will make you cry, it will make you smile, and above all it will make you feel. That may be a cheesy thing to say but this is anything but a cheesy book.